The shale revolution has resulted in North Dakota becoming the 2nd largest oil producing state, passing both Alaska and California this year. 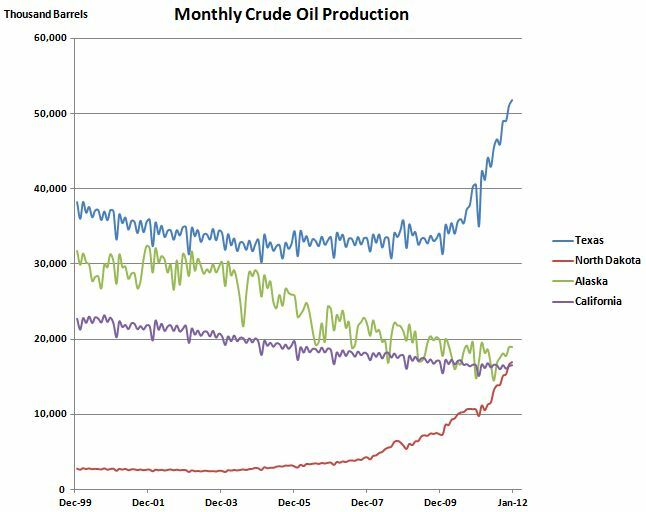 Below is the most recent data (February) from the Energy Information Administration, which highlights the powerful up trending production from both Texas and North Dakota. Alaska and California’s declines are even more startling when one considers that these states have far larger petroleum reserves than North Dakota. North Dakota has overcome this relative handicap through the successful adoption and implementation of technological advancements in horizontal drilling and hydraulic fracturing. As state productivity increases, its unemployment rate has dropped to the lowest in the country at 3%. Texas and Alaska come in at 7% and California at 11%. The Fraser Institute’s 2012 “Global Petroleum Survey” ranks regions by investment climate, based on key drivers such as high tax rates, costly regulatory schemes, and security threats. Of 135 regions worldwide, Texas ranked 5th, North Dakota 10th, while Alaska and California ranked 83rd and 91st, surrounded by such unfavorable jurisdictions as Argentina, which recently nationalized a Spanish oil company. Investors placed China ahead of California, judging it to be a safer place to put their capital than a state with a notoriously unfriendly business climate, renewable energy mandates, hefty environmental regulations, public vilification of the oil industry, and a ban on new offshore leases that has persisted since 1969. California’s cap-and-trade system further weakens its standings; it will soon to be linked to the Canadian Province of Quebec’s system that has been described as “equally rigorous”–Quebec falls in 92nd place, one ahead of Egypt ranked 93rd. Under the burden of ACES, Alaska has one of the highest tax rates in North America, a sure incentive for companies to invest elsewhere. On Wednesday, May 16th, environmental and tribal groups filed a challenge to further postpone Shell’s Alaska Arctic drilling plans, a strategy that has already led to four years of delays. Shell has invested more than $4 billion by purchasing Alaskan offshore leases in 2005 and 2008; time ticks away on the 10-year expiration terms and, though widely expected to yield high reserves, the first well has yet to be drilled. As Repsol’s 150 million dollar dry hole demonstrates, there is no sure thing in the high capital-risk oil and gas exploration business. In a world where access to energy is correlated to standard of living, North Dakota has taken the high road by limiting obstacles to its production.